Jurgen Klopp saluted Liverpool's record breakers after a 3-0 win at Watford extended their unbeaten run. Mohamed Salah, Trent Alexander-Arnold and Roberto Firmino scored second-half goals to seal victory at Vicarage Road. But Jordan Henderson will miss next weekend's Merseyside derby with Everton after being sent off late on for two bookings. The Reds are now unbeaten in 13 games this season and sit two points behind Manchester City, who won 4-0 at West Ham. Liverpool also now have the most points - 33 - they have ever had at this stage of a Premier League season. Klopp said: "It's nice, the 33 points are brilliant and the goal difference is really good, I like all that. "At this fantastic big club with outstanding teams in the past, that this group of players can get this record is nice. "The season is not finished and it doesn't bring anything but if someone wants this record in the future they must beat this team. "It was a really mature performance. We never controlled games in the manner we do now. I know people miss one or two situations from last season but we have these games." Salah broke the deadlock with his ninth goal of the season, tapping in Sadio Mane's cross, and appeared to celebrate with a gesture which Sergio Ramos uses when he scores. Ramos, who injured Salah in last season's Champions League final, is under the spotlight after German magazine Der Spiegel claimed the Real Madrid captain returned a positive test for the glucocorticoid dexamethasone after the 2017 Champions League final in Cardiff. No action was taken as it was deemed to be due to an 'administrative mistake' while Ramos has denied any wrongdoing and the World Anti-Doping Agency has said the matter is closed. 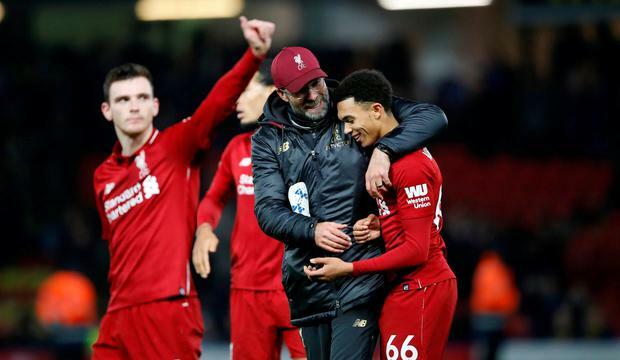 Klopp added: "I didn't even see him celebrating. I celebrated myself." Alexander-Arnold's brilliant free-kick made it 2-0 before Firmino ended his Premier League drought in the last minute, scoring in the top flight for the first time since September. Klopp said: "To explain how difficult it is to prepare for a game like this is hard. I know you always expect perfection but we had one session to prepare. "They came back on Thursday, the Brazilians and Robbo (Andy Robertson) for example. With the demands on set-pieces, you need your own set-pieces, you need to work on the specific quality of the opponent." Defeat leaves ninth-placed Watford winless in their last three games but they were furious after being denied a second-half penalty. With the score level Robertson clipped Will Hughes in the box but referee Jon Moss ignored the hosts' protests. Boss Javi Gracia said: "The last two games we have been unlucky with some decisions but I prefer to always support referees and if I don't say anything about their work in these two games I will not do it for the rest of the season. "In these type of games you need to score if you have one chance. "If you don't do it you know they are able to score."